11/07 - Populating my home entirely with custom made furniture, designed for a specific spot and built with my own hands, has always been a pursuit of mine. On that note, we had a perfect spot picked out for a corner cabinet of quarter sawn white oak, with flat panel doors designed for the bottom, and glass doors on the top, to match the sideboard I made for our dining room.. The 4/4 hardwood stock for the main casework had already been selected and was acclimating in the shop while the final design/construction details are worked out. After the usual dimensioning of the rough stock to project thickness, batch cutting of the face frame rail and stiles and other project parts; routing of dadoes and grooves in the face frame components to accept the side panels; and routing of the side panels and back to accept the top, bottom, and middle shelf; the flat, front part of the face frame was constructed using loose mortise and tenon joinery. 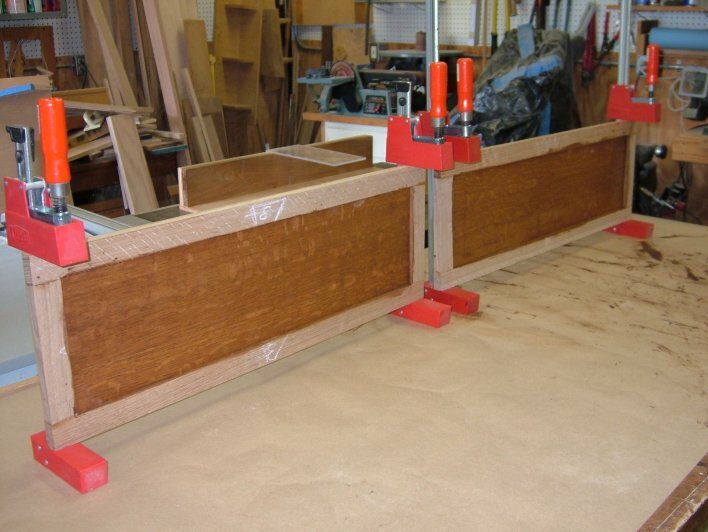 The gluing jig, pictured above from both sides, is basically a 'to scale' mock-up of the front third of casework top, bottom and the middle shelf. 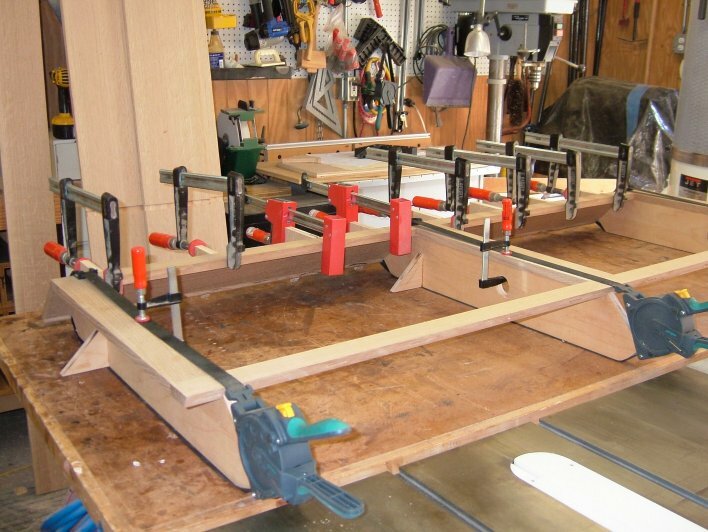 Along with the application of biscuit joinery in the mitered parts, and the previously routed dadoes in the face frame components and sides, this jig allows the parts to be held in precise alignment, and at the proper 45 degree angle, during the gluing and clamp-up process. Scraps were used to make angled clamp blocks and, with the aid of three band clamps, one side at a time of the angled face frame is glued and clamped, then set aside to dry. Applying the finish before glue up will help with clean-up of glue squeeze out, and also makes it easier to apply a gel stain, which can be hard to wipe off in the confines of an already assembled corner cabinet, with all its hard to reach angles. Onward to the actual casework, which will make up the cabinet box itself. This step involves the marriage of the horizontal components (top, bottom and middle shelf), with the cabinet's two sides and back. As with the fabrication of many cabinets, it can be advantageous to assemble these components on top of the already completed "face frame" above. Along with the custom design, and since off-the-shelf trim in quarter sawn white oak is not readily available, I decided to design a custom 'cove' profile for the crown molding on top of the corner cabinet, and fabricate it myself. While not normally the tool used to cut profiles for molding, the shop table saw can be readily, and safely, used for the task. And, doing it on the table saw also makes for an interesting, fun and rewarding problem to solve ... determining the angled, compound cut that results in the desired shape ... an exercise in using that geometry and math you were once convinced you would never have to use again after graduation from school. Below, the newly made crown molding being test fitted to the face frame. Once again during final assembly the risk of glue sticking to the finish during glue-up is mitigated by pre-staining. As seen, the completed cabinet casework is used to hold the three crown molding pieces in the correct orientation during glue-up of the crown molding assembly (#0 biscuits are used to reinforce the 22 1/2 degree miter joints). Next, the base for the corner cabinet is then constructed, and attached, in much the same manner/method as the crown block, as can be seen below. The basic corner cabinet casework, complete with base and crown, finally standing on its on. The trim piece on the middle rail and the four doors and shelves remain to be fabricated, but the 76" tall case, which has been taking up space in the shop and making it difficult to move about, is finally out of the way and work can now commence on those parts. 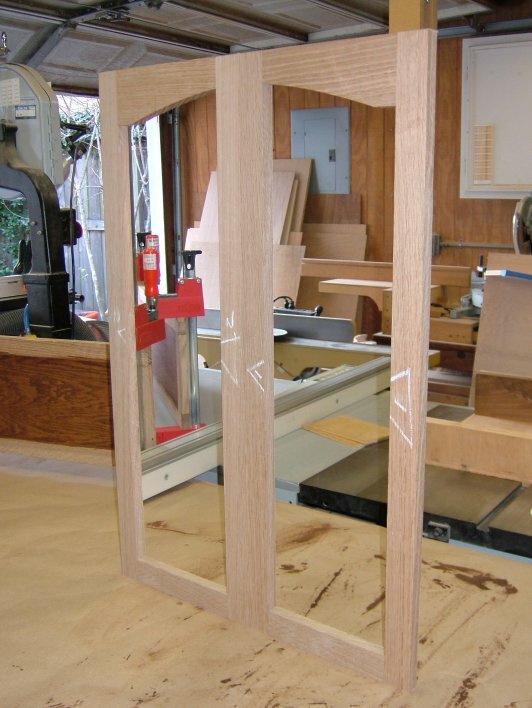 Four doors are planned for this corner cabinet: two wooden panel doors for the bottom section, and two glass panel doors for the top section.